The following document explains how to modify an event using the iOS Calendar app (iPhone, iPad, or iPod Touch). To modify an event, tap on it in the iPhone Calendar display. On the Edit display modify the event's details. Tap on the red Done button when your changes are complete. Note: the red 'done' button will only appear if changes have been made. 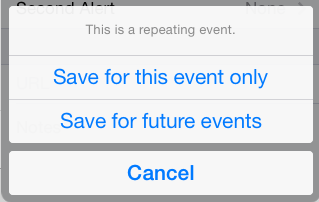 If the event is part of a recurring event, you will get a confirmation display asking whether you want your change to apply to only one or all future events of the recurring events. On the iPhone Calendar display if you Touch-and-Hold an event two small drag-handles appear (the round circles at the beginning and end of the event block) which you can Tap-and-Drag to modify the event begin and/or end time. The far left column of the time grid will show in black, bold text the time at which the drag handle is located as you drag it.